Wirreanda offers spacious dormitory-style accommodation, located at one of the region’s most visited tourism attractions – the World-Heritage Listed Naracoorte Caves National Park. Ideal for school camps and tour groups, the Bunkhouse comfortably sleeps 45-50 people, with two to eight persons per room. 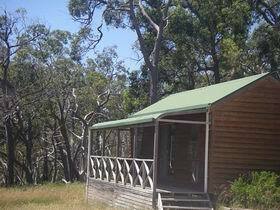 Wirreanda is ideal for a family on a holiday budget. The modern fully-equipped kitchen feels like a home away from home with crockery, cutlery, cooking utensils, a stove, refrigerator, and a microwave provided. A separate laundry and toilet facilities are also available. Surrounded by rolling countryside, Wirreanda’s peaceful setting in Naracoorte Caves National Park is a haven for wildlife. Awake to the sound of lorikeets in the trees or watch kangaroos quietly graze in the park. 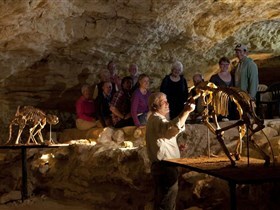 The magnificent Naracoorte Caves visitor precinct is just 500 metres away, where ancient fossils of giant megafauna, ornate limestone caves and the thrill adventure caving awaits. The park is also the summer home of the southern bent winged bat. Regional highlights such as Coonawarra’s wineries, the seasonal bird sanctuary of Bool Lagoon, and Mary McKillop’s Interpretive Centre in Penola are all within 30 minutes drive.